Vermivore [VUR-mee-vohr] (noun): One that eats worms. This neat word comes from the latin words “vermi” meaning worm, and “vorare” meaning “to devour”. When we think of animals that eat worms, one of the first that comes to mind is the American Robin. This beloved bird is familiar to many of us in the city. The American Robin is often thought of as the harbinger of spring. Once the ground begins to thaw from the spring sun, we are quick to see them looking for wiggly earthworms to eat. Early spring is also the start of their breeding season so their feathers seem extra colorful and the joyful “cheer-up, cheerily, cheer-up, cheerily” call can be easily heard. Once thought to locate worms through their sense of hearing, American Robins actually find worms by sight! Like many other birds, American Robins have exceptional eyesight. They will tilt their heads and use their keen eyes too see the tiny ends of a worms as they poke out of the dirt. They can also their eyes to notice any small changes in soil and grass as the worms move around just below the surface. These small movements let the American Robin know where a worm is. 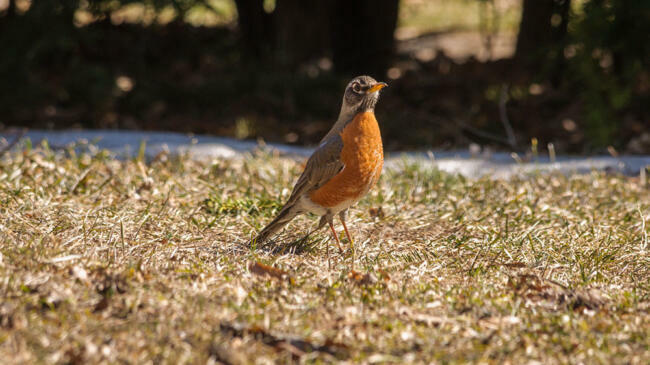 Keep and eye out for American Robins running, hopping, or flying around near you!